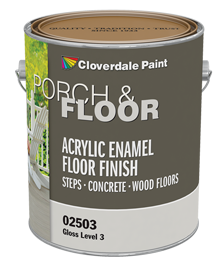 Interior/Exterior Porch & Floor Acrylic Coating is a premium interior/exterior 100% acrylic latex floor finish for use on steps, concrete and wood floors. Ideal for painting basement and utility room floors, concrete patios and porches. The low odour, fast dry formula is suited for household or light industrial uses. An eggshell sheen provides moderate non-skid surface characteristics. Where additional slip resistance is required, a particle aggregate may be added to the coating. Check with vendor representative for recommendations. Provides good resistance to alkalis and ultra-violet light. Approved by the Master Painter's Institute under category # 60.